Most of the people in agency land will know that we’re not afraid to enter ourselves for the odd award every now and again. And judges have been kind over the years and we’ve been a recipient of a good number of them. However, Wednesday night will go down in the annals as something of a classic as Jo and James wended their merry way to Berlin and the Sabre Awards 2016. In the event, we were bagged one of the early gongs of the night as we fended off Cirkle, Mischief, the Red Consultancy and M&C Saatchi PR to be named EMEA Consumer Agency of the Year. A huge result for the team and a recognition of the staggering work that goes into the agency from the 52 or so of us who now work here. Then there was success in the campaigns category as we picked up another four gongs across four different clients. 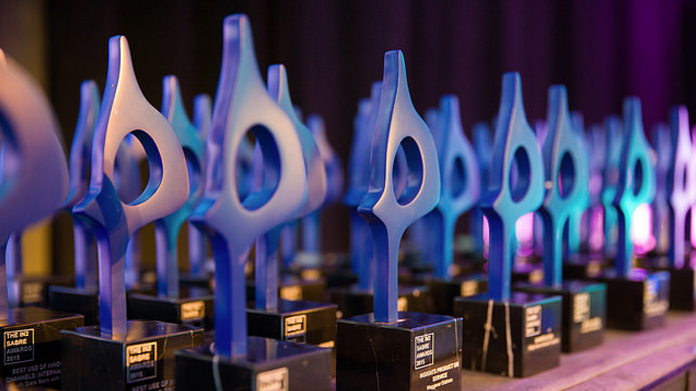 First up, O2 were awarded the Sabre for Best Consumer Technology Campaign against some serious competition. The GuyFi work was an appropriate winner, we thought. Next came success for IKEA as the Breakfast in Bed Cafe picked up an award at long last – it’s been an agency favourite so genuinely lovely to get some silverware for the work on its last (pretty much) outing in the shows. Then there was more whooping as Airbnb picked up Best Stunt for the Floating House. And the night was rounded-off by The Royal Mint who won an award for Best Institutional Image for the work we did with them on the launch of the fifth effigy of the Queen in 2015. Altogether a stunning night and one on which the judges smiled from on high.